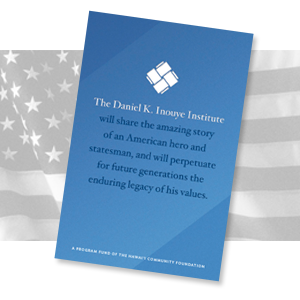 The Daniel K. Inouye Institute was established in 2013 to preserve Senator Inouye’s papers and tell his life story; support STEM education, civics learning and international educational-cultural exchanges; and establish a repository of the Asian American/Pacific experience. The Inouye congressional papers, from which pertinent components will be digitized and shared with the Library of Congress to create a virtual reading room. An oral history which will complement the telling of Senator’s story by his family, friends and colleagues in Hawaii, throughout our nation, and on an international stage. The Dan and Maggie Inouye Endowed Chair. Academic programs including the Public Policy Center and public lectures on leadership and the importance of civic engagement. Support for middle and high school STEM and civics programs to inspire the next generation of leaders. The Inouye video and media collection at the Giugni Archives at the University of West Oahu, which will be digitally available. Partnership between the Smithsonian Institution, Bishop Museum and the DKI Institute to tell and share the Asian American Pacific story in Hawaii.